A good set of kitchen knives does not need to break your budget entirely. In fact, there are quite a number of brands that offer affordable and reliable kitchen knives, which are guaranteed to improve your cooking experience and save you a considerable amount of money. Due to the numerous messages we’ve received from our readers, we’ve decided to do review the best kitchen knife sets under $100 based on their materials, storage options, durability, and practicality. 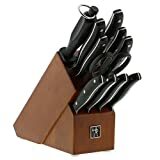 The Farberware self-sharpening knife block set contains 11 knives, a pair of all-purpose shears, and a storage block. Each slot in the storage block hones the knife as you remove it or replace it. The Farberware set comes with a basic chef knife and santoku, and it also includes steak knives and paring knives. Furthermore, each knife is made of high-carbon stainless steel, which means they are stain and corrosion resistant. This 22 piece set comes with almost every knife shape you would ever need. You get multiple sizes of chef’s knives, a Santoku, a carving knife, paring knives, and a bread knife. It also has a carving fork, kitchen shears, and a knife sharpening tool. If you love minimalist, modern designs, this is the best kitchen knife set under $100 you could get. The blade of the knife extends throughout the handles, which are triple-riveted together, so these knives are quite sturdy. With this kit, you get five cooking knives, six steak knives, kitchen shears, and a sharpener. If you’re looking for a high-quality chef knife, be sure to read our reviews on the best chef knives of 2019. Each one of these knives is made from a single piece of stainless steel, so the knife won’t snap off at the handle. In addition to six steak knives, you also get a chef knife, bread knife, carving knife, utility knife, paring knife, as well as an Acrylic stand. If design is important to you, this is the best kitchen knife set under $100 you could get this year. Recommended reads: Would you prefer a multi-purpose pro knife instead of a set? Then check out our article on the best chef knives you can buy this year. And if you’re on a budget, make sure you also check out our article on the best chef knives under $50! 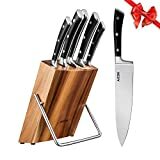 This 14-piece knife set includes 11 stainless-steel knives, one pair of scissors, one pinewood block, and a wood block. This sturdy and affordable set from the AmazonBasics line of home furnishings contains most basic knife types, however, their chef’s knife has a particularly nice shape; it is curved enough to cut in a convenient rocking motion. 8 PIECE STAINLESS STEEL KNIFE SET: Form meets function with this colorful 8 piece knife set. 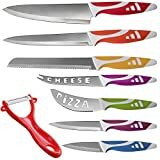 CHOP SLICE AND PEEL WITH EASE: 7 unique knives plus ergonomic peeler, all with easy grip handles. This set includes 7 kitchen knives made of stainless steel, plus an ergonomic peeler, all with easy grip handles. Each knife is designed for different purposes. The package includes the following: a chef knife, a bread knife, a utility knife, a carving knife, a paring knife, a cheese knife, and a pizza knife. If you like playful colors and utility, this is the best kitchen knife set under $100 you could get as it’s easy to differentiate between them. Are you looking for more advice on choosing the best knives for your kitchen? Take a look at our extensive buying guide below! In addition to the standard chef, Santoku, and serrated knives, this set from Cuisinart also has a sharpening steel tool and kitchen shears. A thick bolster provides security and control while using each knife and the ergonomically designed steel provides extra comfort while chopping and slicing. This 18-piece kitchen knife set from Chicago Cutlery is made of high-carbon steel blades with poly handles and are constructed with taper grind edge technology which ensures their durability. 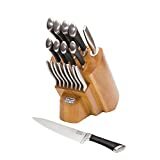 The Chicago Cutlery knife set includes a peeling knife, a utility knife, a paring knife, a slicer, chef, bread, partoku, santoku, and steak knives. Of course, the wooden block is also included; the set also comes with a sharpening steel. The Aicok kitchen knife set contains five knives made of high-carbon stainless steel, along with a wooden stand. Though there are only a few knives in this set, each one is a quality kitchen instrument. The comfortable grips are riveted onto the tang of the knife, which extends throughout the handle. Each set includes a chef knife, bread knife, carving knife, utility knife, and paring knife. The second best kitchen knife set under $100 is designed in Germany and comes with a lifetime warranty. J.A. Henckels lives up to their reputation for quality construction with this set. Each blade is made from a single piece of precision stamped steel with a grippable handle riveted onto it. The set contains 9 kitchen knives, a pair of kitchen shears, sharpening steel, and a hardwood knife block. This is, by far, the best kitchen knife set under $100 available for online purchase this year. As you can see, there are many different kitchen knife sets available for under $100. When making your decision, be sure to consider your budget and cooking habits in order to determine which one of these top sets works best for you. Our personal favorite as the best kitchen knife set under $100 is the J. A. Henckels set, but you couldn’t go wrong with any other product on this list.